Malawiâ€™s President Peter Mutharika launched his Democratic Progressive Partyâ€™s manifesto and election campaign Sunday, ahead of next monthâ€™s elections where he will seek a second and final term in office. 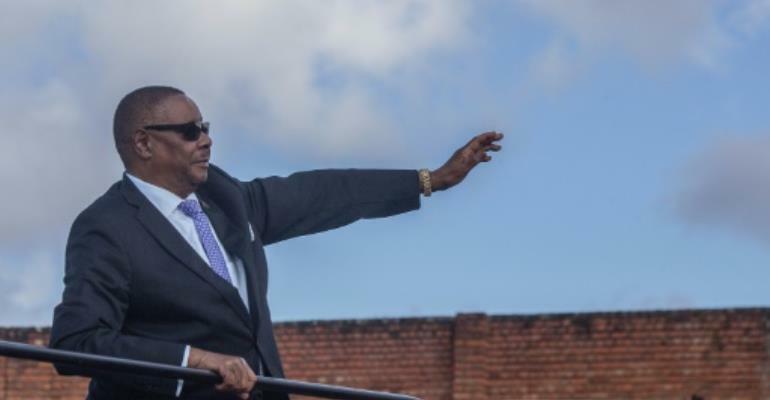 "This is the most important campaign since 1994 when Malawi attained multi-party democracy," Mutharika told over 5,000 supporters at the Kamuzu Institute of Youth in Lilongwe. "This year we choose between going forward or going backwards." But on Sunday he told his supporters: "In 2014, we made promises and kept the promises. "We are government that has done more in the last five years than any government has done in the history of Malawi. "We are ready to take Malawi further from poverty to prosperity," he told the jubilant crowd. And he held his hand out to the opposition, calling on them to "just come and join us so that we build together, because they are not presenting any new ideas". Chilima, 48, quit Mutharikaâ€™s party to form the United Transformation Movement, while staying on as vice president. Under Malawi law, the president cannot fire the vice president. The other two contenders are Lazarus Chakwera, head of the main opposition Malawi Congress Party (MCP); and Atupele Muluzi, health minister in Mutharikaâ€™s government. Atupele Muluzi, 41, who launched his partyâ€™s manifesto in Lilongwe on Sunday, inherited the United Democratic Front from his father, Malawi's third president Bakili Muluzi. The party entered into a parliamentary alliance with the president's party after Muluzi came fourth in the 2014 elections. About half of Malawi's 18 million population live below the poverty line, according to the World Bank, and the country relies on foreign aid. Food shortages, power outages and ballooning external debt have hurt Mutharika's popularity ahead of the vote.